The CVG team — our commercial vehicle group, also known as our truck repair experts at Mitchell 1 — were very busy last year. In addition to working hard on improving the medium- to heavy-duty truck repair software and getting repair information documented in a timely manner, they also shared their knowledge here in the ShopConnection blog. 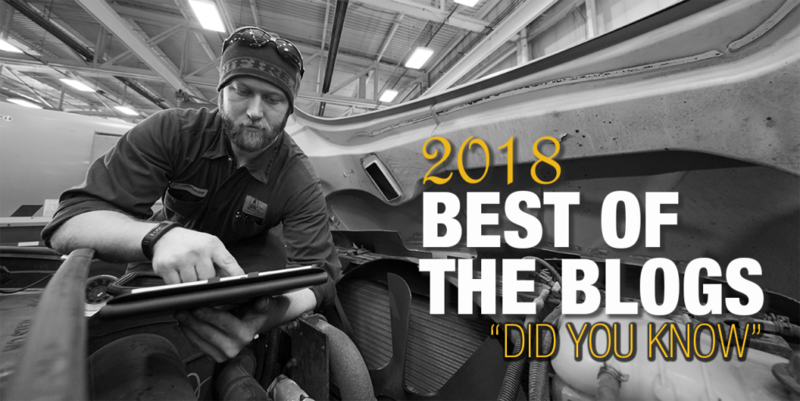 Last year, they continued their passionate commitment to helping commercial truck repair shop owners and their teams by educating them on industry trends, new tips n’ tricks and other helpful information that makes life in the shop easier. Below is a digest of just a few of the pearls of wisdom from our experts— all of which we hope you find help you get to your fix faster! Use this handy list to make sure you aren’t leaving any points of inspection undone. Also, enjoy get additional inspection tips as well as resource links to other winter season repair information. Discover the impact of wide tires with this blog and graphical representation and find out what it means for the truck technician. Get up to date on your DEF knowledge by taking a look at some of the common industry names for DEF, how it should be stored and how testing should be performed. Become familiar with the terms used when discussing OEM requirements for replacing batteries and learn some of the reasons a battery can test well but still fail to perform as expected. Get to know what the lights on the trucks dash mean. For the technician, this can help you reach a fix faster rather than taking the time to search through information. For the driver, understanding these lights allows for quicker safety decisions to be made while driving. Do you know how to check to make sure you are getting or selling a safe tire that has not been sitting on the rack too long? This blog explains how to read the build date and why the build date is important for finding a safe tire. Understand what barometric pressure (BARO) does and how to get your locations BARO in order to troubleshoot the BARO fault code. Jake Schell goes over key steps to keep in mind when trying to diagnose electrical issues, so you can reach a more accurate diagnosis. What Do You Mean I Need to Fill the Hubs? Learn how to fill the hubs with a step-by-step how-to using Meritor drive axle ends as an example.